The 6th episode of graphic novel ‘Mujib’ has hit the shelves on March 17, 2019, at 99th birth anniversary celebration event of Father of the Nation Bangabandhu Sheikh Mujibur Rahman. The graphic novel is based on the ‘Unfinished Memoirs’ of Bangabandhu during his time as a state prisoner. 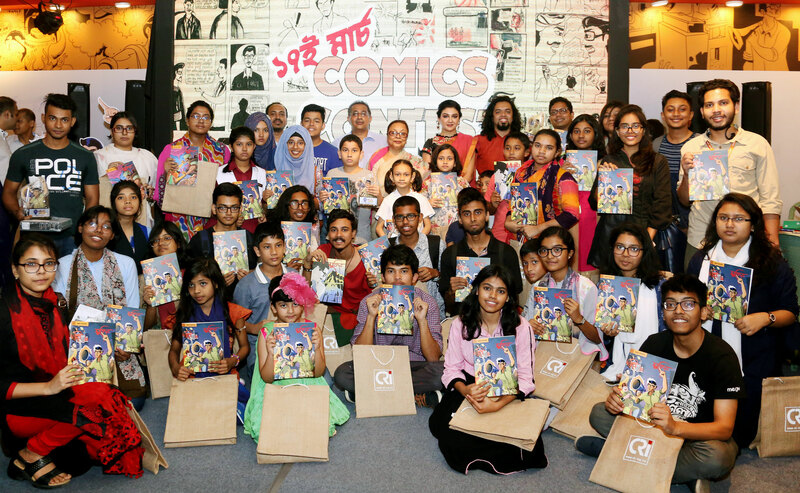 ICT State Minister Zunaid Ahmed Palak MP, actor Jaya Ahsan, CEO of Bangabandhu Memorial Museum, Mashura Hossain, CRI Executive Director Sabbir Bin Shams, CRI Creative Director Shibu Kumer Shill, artist Syed Rashad Imam Tanmoy unveiled the 6th episode of graphic novel ‘Mujib’. In this issue, the hiccups of Pakistan movement, political suspense and mounting tensions, different aspects of Khawaja Nazimuddin, Sher-e-Bangla A. K. Fazlul Huq, Husssain Shaheed Suhrawardy were covered. Besides, Bangabandhu’s deep feeling to start a newspaper and the initiative and its success also came up lively. The generosity of Suhrawardy to keep party united and on the other hand Bangabandhu’s constant strive to make other understand what is going right and wrong in politics came up formidably. 5th edition of ‘Mujib’ illustrates how Bangabandhu, in 1945, was denied his deserved post in Chatra League, the student wing that got no other election until 1947. The World War-II, black market, some vested quarters created by cashing in on the war, put the country in turmoil. This was the situation that sparked the zeal of young Mujib to rise in response to the situation and make a difference. ‘Mujib-4 Delhi Adventure’ tells the story of Bangabandhu’s journey to and from Delhi to Calcutta. It highlights Bangabandhu’s experience attending the then Muslim League’s annual conference and the meeting between Hussain Shaheed Suhrawardy and himself, along with his fellow Chatra League activist. ‘Mujib-3’ highlights the post-World War II period of the life of Bangabandhu when he emerged as a rising politician and successful organizer despite many obstacles. Mujib – 2, the 2nd edition of the series, covers the political rise of Bangabandhu and his growing ties with his political mentor Shaheed Suhrawardy along with an important football match between the young Mujib and his father. Mujib – 1, illustrated the childhood of Bangabandhu and how he got involved in politics. It presents the background against which Bangabandhu began writing his autobiography, the stories of his birth, childhood, getting a pair of spectacles when still young, and his first jail term. Graphic novel series ‘Mujib’ was created under the vision of CRI Trustee Radwan Mujib Siddiq aiming to sensitize and educate the young children of Bangladesh about Bangabandhu. The colorful graphic illustration and visualization used in the ‘Mujib’ series was done by artists Syed Rashad Imam Tanmoy, CRI Creative Director Shibu Kumer Shill is the editor. This graphic novel series presents the political activism, successes and political wisdom of Bangabandhu in a youth friendly manner that also appeals to adults and comic book enthusiasts alike. The series has been selling well since the release of the first edition and the excitement continued with each new release of the Mujib. The series has gained immense popularity with countless young readers, creating a lasting impression, shaping their values and making them politically informed. Last year, a Japanese version of the graphic novel was launched at the Bangladesh Embassy in Tokyo, Japan. Mujib-6 will be available at Charcha, Pathak Shamabesh, Batighar Dhaka and Chattogram and other popular bookstores.